"A Tradition In Colorado Springs Dining!" 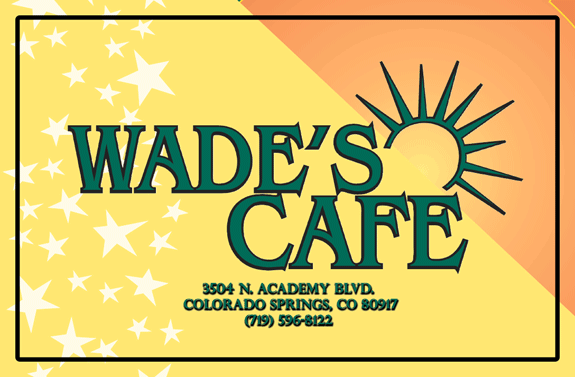 ﻿Wade’s Café has been a part of the Colorado Springs community since 1953. Generations of Springs families have grown up sharing delicious, homemade meals together at Wade’s Cafe. At Wade’s, we serve up homemade traditional American breakfast and lunch. Our award-winning pancakes and homemade syrup are bound to brighten up your morning. When you come into Wade’s Café, you will be welcomed as a member of our family. We place an emphasis on friendly, fast service, and our exceptional staff will make you feel right at home. Wade’s Café has been serving breakfast in Colorado Springs since Thomas “Shorty” Wade, first opened the original “Wade’s Pancake House” in 1953. His recipe for success was homemade food, great service, and a great price. We continue to be committed to those values and our customers keep coming back. Our breakfast features home-style food, large portions, affordable prices and is served all day! Whether you are looking to start your day with our award-winning pancakes and homemade syrup, delicious omelets, or any other tasty breakfast item, visit Wade’s Cafe today! Big flavor and large portions is the best way to describe Wade’s Cafe lunch menu items. Our fresh, American-style lunch is served from 6:00 a.m. to 2 p.m. Ask us about our daily lunch specials. Serving the best burgers, sandwiches and other traditional lunch favorites in Colorado Springs! Wade's Cafe is a great restaurant! I have been here three times when I come to visit my friend. We come here for breakfast and I usually have the French toast, scrambled eggs, and bacon combo! The food is terrific! Although we have to wait to be seated because it's always busy, it's worth the wait! This place is hands down delicious. The wife and I go multiple times a week and enjoy it every time. The kids love it also! This place is hands down delicious. The wife and I go multiple times a week and enjoy it every time. The kids love it also! Definitely worth a try! Visiting from CA. Service was excellent, staff was friendly, food was really good and reasonably priced. I had the #1 (French toast, eggs, and bacon). Will definitely be back on my next visit. First time we've eaten here and let me tell you something, the BEST breakfast we've had since we moved here a few months ago. Amazing, dedicated staff and some top notch cooks. Can't wait to try some lunch there sometime, but it's gonna be difficult passing up breakfast. lol Highly recommended!!!!! Wow!! What a great Yelp find!!! Sara, our waitress started off our great experience and then it just kept getting better and better. Upon inquiring about the green chili, she offered us samples to try. Outstanding customer service! I had the Hueveros Rancheros with green chili. The eggs were cooked exactly as ordered, which doesn't happen often, the green chili was delicious, wth just the right amount of spices. The hashbrowns were cooked just right, crispy on the outside and soft in the middle. Sara kept our drinks refilled, checked on us and was so pleasant. My wife had the two-egg green chili omelette with the two-dollar pancakes. The pancakes melted in our mouths (yep, she shared begrudgingly ) and she enjoyed the omelette. Next time we are in The Springs we will be back. Sara, you are a great asset to this restaurant! We were from out of town and we like to sample local flavor... our meal was great! Cooked perfectly and very tasty! Pancakes were great and syrup was so good we bought some to take home!! Wade’s Cafe is exactly what I was hoping to find in a diner. The eggs Benedict are the best I’ve had, and nothing on their menu has let me down. I salivate just driving past. Do yourself a favor and give them a try! Omg first time going was told about this place by a good friend! Moved here from chicago and I might say there is not a lot of good restaurants here! But this spot is just right reminds me of the good food back home! My new favorite spot!